Hi again! I saw so many year in review posts these past few days that I decided to take a look back at my own 2012 and see what I've done. So, here it is! And also, it was a good chance to let you all see my new header and tell me what you think! 2012, the year of the comeback! In January, I was still on the injury list, working on all my physiotherapy goals. I was wearing my fancy calf-stretching boots to bed nearly every night. In February I had worked my way back up to some short runs and ran a 5k! It was a chilly day. After that I started training for a half marathon and decided it was high time to start some proper speed work. I began with fartleks. I then added tempo runs. They were, well, a challenge. 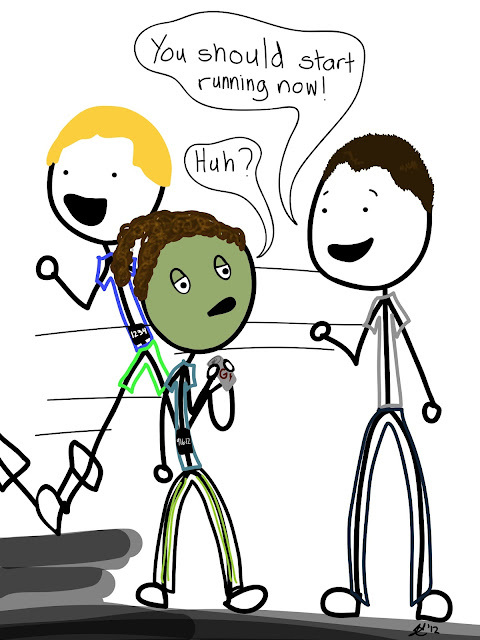 While I continued to build my running skills through the spring, I sprinkled in some different exercise. Like yoga. In June I ran my A race with Ann Marie, the Seattle Rock 'n' Roll Half Marathon! That was the same weekend I got to meet so many bloggers from near and far! Some of the best peeps! Once I'd tucked away my big comeback race, it was time to start thinking about my July triathlon! With very little preparation, I enjoyed an incredibly fun weekend of watching TriGuy race his first Half Ironman, watching Ann Marie run another half marathon, and slogging my way through my sprint tri. In case you didn't know, I really love high fives. I ran another half marathon in September, putting on record my smashing personal worst as I was struck with illness right before the race started. That was not the most fun race I've ever had, but I hope to run it again next year in better health. The good news is that I'm better now and maybe I'll actually learn to balance on my bike and swim in a straight line! Finally, I celebrated 2 years of blogging in December! Is it odd to link to a retrospective post in a retrospective post? It's like Inception. My plan for 2013 is to focus on running, but I won't rule out a sprint tri and perhaps some new workouts; for example, my friend Jenna wants to take me to a TRX class! Lord help me. 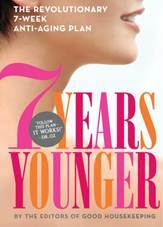 *Don't forget, you can still enter for a chance to win the book 7 Years Younger! 2. How was your year? Do you have big plans for 2013? 3. Thoughts on the "Pin It"s next to the pictures? Helpful or too much clutter? I'm linking up with "Yeah Write". There are so many great writers there! Just click on the button below to check them out. UPDATE: WE HAVE A WINNER! I used Random.org to select the winner (but while trying to cut and paste it here, it reloaded the site. I'm cool like that.) The winner is Megan from WatchMegoRun! A while back, I was contacted by the editors of Good Housekeeping to review their new book 7 Years Younger. Their media packet states that "This is an easy-to-follow guide that delivers proven results, based on established science as well as testing in the Good Housekeeping Research Institute, to help women look and feel their absolute best. "-Rosemary Ellis, Editor-in-chief, Good Housekeeping. I thought it would be fun to get some tips on how to look and feel my best, so I requested a copy. I'm not sure what I was expecting, but the book was not quite what I was expecting. It was a little bigger. Perhaps it was so heavy because there were two...I got one for one of you! The book is laid out in such a way that they introduce the concepts of the chapter, then give you a quick start. This is followed by a 7 week plan and testimonial by one of their panelists. I like the fact that they back up their information with research. They have lists of the best makeup and skincare products based on price and test subjects' responses. This is very helpful if you are anything like me and get completely confused about what to put on your face. If you are ready to spend some time focusing on your health, this is a very good book. It gives you the reasons behind the foods you should eat, what vitamins you need, and the best sources for them. It also has a great plan for starting to exercise if you currently do very little to none, has healthy recipes, and ideas for choosing better meals when eating out. If you would like to win a copy of this book, leave a comment below telling me how you would like to change things up this year! 1. Follow me on Google Friend Connect, or let me know if you already do. 2. Twitter @triingathlete, or let me know if you already do. 3. Tweet about the giveaway, and come back leaving a comment that you did so.